The spine commonly called the backbone is responsible for one’s stabilty and mobility. The spine is made up of many bony segments , the vertebra and the fibrous tissues referred as the inter vertebral discs. Degenerative disorders, fractures and dislocations of the discs of the spine between the upper and the lower ends, any kind of deformity or infection to the spine ,all lead to chronic back pains leading to the requirement of treatment . Some of the probems associated with spine are treated consevatively, but some conditions needs to be treated surgically. Both open surgery or minimal invasive surgery can the used for the treatment. However, minimal invasive surgery is trending among the doctors as it gives faster recover period for the patients.Some of the surgical methods used for the spine surgery are the following. 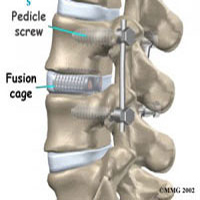 A lumbar spinal fusion is a traditional method used for treating pain or instability associated with degenerative discs.The method involes the insertion of the screws into the spinal bony segments which are then connected in position with rods. A small part of the bone is taken from the patient’s pelvic area, and is placed across the vertebrae, so that a new bone is formed between the two vertebrae. The main goal of this is to restrict the movement of the affected vertebrae and thereby relieve pain. Spinal fusion has been performed as minimally invasive spine surgery. This type of surgery has gained importance recently. The procedure is carried out by making only small incisions as compared to the traditional methods. The whole surgical process remains the same apart from the smaller incision and the utilization of the advanced fluoroscopy and endoscopy that enables the accuracy and minimizes the risks. The intervertebral disc placed between the vertebrae contains a jelly -like substance called the nucleus pulposus. These serves as the shock absorbers. Once these nucleus pulposus are damaged, they put strain on the surrounding collagen tissue and this eventually leads to the degeneration of the discs,which in turn causes back pain. During this procedure, an incision is made in the abdomen and the muscles are retracted to access the spine . Then the damaged intervertebral discs are excised, removed and then replaced by artificial discs ( prosthesis). Once the surgery is completed the incision is stiched together with dissolvable sutures. Medications are given to reduce the pain. After the procedure, a hospitalization period of three to five days are required. What are the risks to be taken care off? Generally majority of the patients experience no complications, however certain risks are associated with every surgery. Such common risks are formation of blood clots, blood loss, or damage to nerves, infection, recurrent disc herniation or anesthesia associated problems. The first and foremost reason for most spine surgeries is reduction of the back pain, which inturn gives a person better fitness and activity. Most of then can regain their activites such as walking or standing for long time without pain. Most of the patients can resume their work and lead a better life with good care.